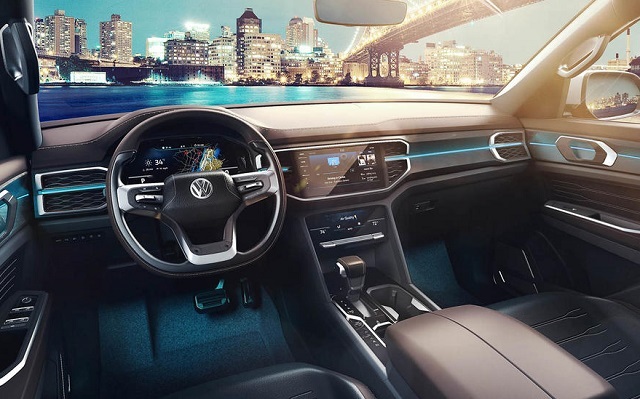 This year’s New York Auto Show has brought some interesting models and Volkswagen was one of the most active presenters. Even though this German manufacturer isn’t so popular on the American soil its Concepts, Atlas-based Cross SUV and Tanoak pickup truck have drawn some attention. Both were developed on famous MQB platform and with them, VW is planning to establish its position next to Japanese and domestic companies. 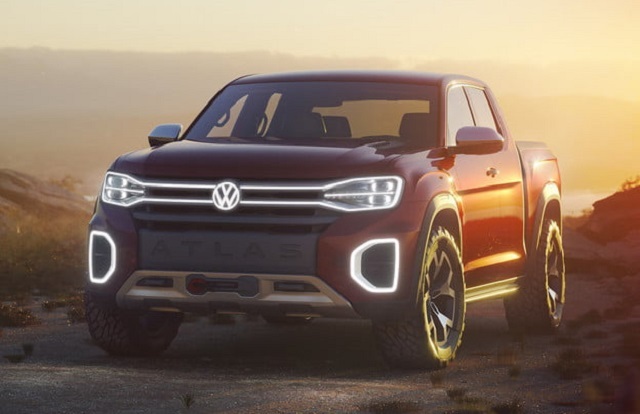 Volkswagen’s CEO for America, Hinrich Woebcken said that there are no plans for production of the VW Atlas Tanoak truck and that it’s only a concept. However, bearing in mind that the truck segment records constant growth, in particular, a mid-size class where the new Tanoak could be fit, the mass production of this model shouldn’t be surprising. This could be a great opportunity to increase sale in North America. VW Atlas Tanoak was an example how flexible VW’s MQB platform is. Volkswagen produces sedans, SUVs and now truck on the same platform. This also tells us something else, the mass production of this truck wouldn’t demand high investments since the technology is already here. Aside from platform, VW has a wide range of powertrains, and design and interior were already borrowed from the latest Atlas sedan. The presented concept truck was a dual cab design with 214 inches long, 80 inches wide and 73 inches tall. The bed size is 64 long and 57 wide. These figures make this pickup a perfect candidate for the mid-size market. As mentioned, the new Tanoak has the similar design as Atlas sedan. A front side has the same air intake with the two chrome crossbars. The headlights with LED daytime lights are also very similar. On the other side, the bed and the taillights arrive with a unique design. Inside of this concept is pretty futuristic and it is not realistic to expect it if the mass production starts. It is more likely that this pickup borrows base details from Tiguan Crossover which will be more truck oriented. However, since mid-size trucks are, these days, more a lifestyle than a necessity some luxurious features could be expected. The new Atlas Tanoak should offer various trim options to cover the market and the upper trims have to be equipped with leather upholstery and gadgets like navigation, touchscreen with the infotainment system and parking sensors. Aside from the unique platform, VW is also famous for its durable powertrains. This could be a good advantage against the tough competition. Variety of the petrol and diesel engines could be found under the bonnet of the new VW truck. The concept model was presented with the 3.6-liter V6 FSI engine. It is matched to an eight-speed automatic transmission and can deliver 276 horsepower and 258 lb-ft of torque. Also, 4Motion all-wheel drive system could be standard with all models. If Board of Directors of the VW America decides to put Atlas Tanoak on the production line some of the diesel engines should come as options too. However, probably the biggest advantage of this potential model would be hybrid powertrain. This move will make it the first mid-size truck with this system under the hood. The hybrid model could be equipped with 3.6-liter V6 matched with two electric motors. This would give even more power and would improve fuel capacity. If the new VW Atlas Tanoak arrives at the US market it will definitely shake the mid-size market. 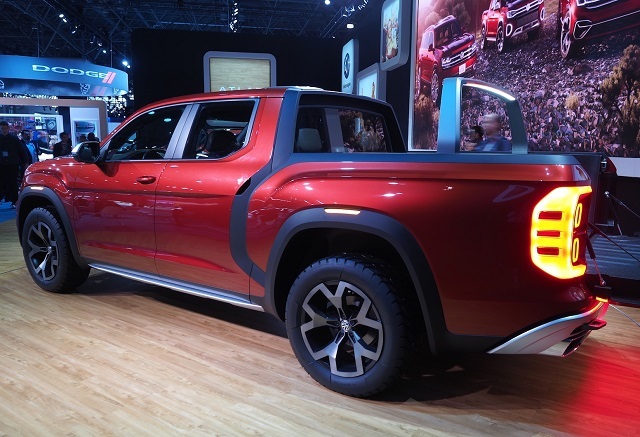 Volkswagen creates great vehicles in every segment and if they find the way to match Atlas design with the right engines and reasonable price this pickup truck could be a great representative of all their future models.